I've always been fairly skeptical about yoga, primarily because of my inherent aversion to sweating but also because the trendy new age vibe kind of creeped me out– there is something decidedly un-punk rock about carrying a mat into a room full of lycra-clad meditating folks. Well, my pal Hannah (who happens to be the mom of three girls under 4 and a hot-to-trot personal trainer) finally coerced me into taking some yoga classes a couple of months ago and I was surprised at how much I loved it, both from a physical and mental perspective. Enlighten Up! 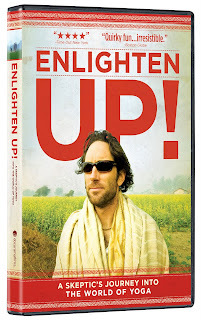 is a film showing another skeptic's serious immersion into the world of yoga. Journalist Nick Rosen was chosen to be documentary filmmaker Kate Churchill's "guinea pig"- a novice yogi who could partake in various practices around the globe while trying to define the elusive "it" that yoga provides to its proponents: spiritual enlightenment, physical fitness or something else entirely. Kate wants to see Nick transformed by yoga the way she has been and the pair visit celebrity yogis and exalted gurus, busy urban practices and laid back devotees. Enlighten Up! is available everywhere on DVD starting November 10, 2009. Disclosure: I received a copy of Enlighten Up! on DVD so I could let you know what I think about it. Go take a yoga class and let me know what you think. If you're near Wichita, these yoga classes are only $5 with no contract to sign. Heated floors, dude. Nice. Ooh! I still want to see this! Me? Hot-to-trot? I bleeping love you.